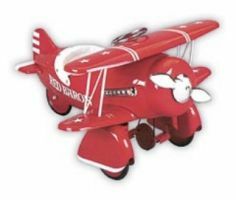 The amazing Red Baron Bi-Plane is a show-stopper with its bright red paint job and chrome propeller! With sleek engine cowling, wing struts, padded seat, custom wheel pants, custom decals, original-vintage graphics, spring-loaded propeller, sealed ball bearing drive, non-slip pedals and high-traction tires the attention is in the details making this a terrific gift for a young aviator. Ages 2-5.